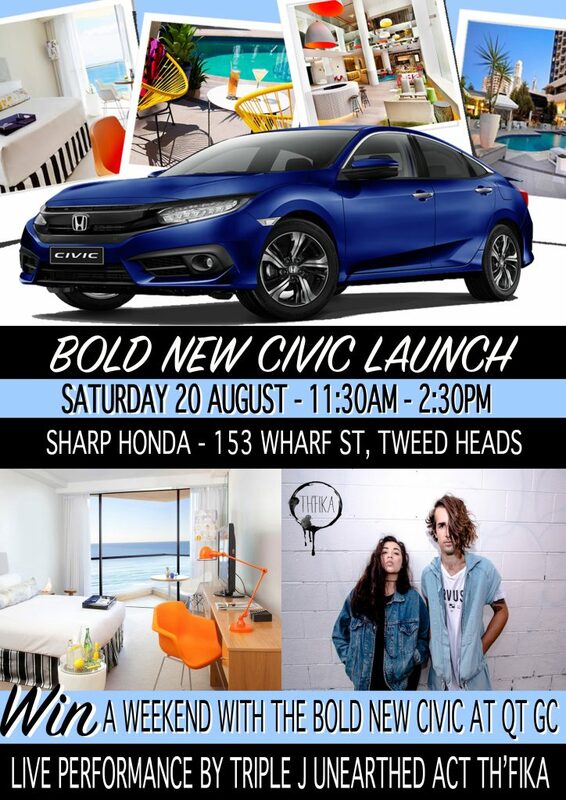 To celebrate the launch of Honda’s Bold New Civic at Sharp Honda, we’re throwing a party on Saturday 20th August! There’ll be a live performance by Triple J favourites TH’FIKA, and we’re giving you the chance to take a mini-vaycay with the Bold New Civic at QT Gold Coast! We have TWO weekends to give away to some bold individuals. PRIZE ONE – WHERE WOULD YOU TAKE THE BOLD NEW CIVIC? Share a photo on Facebook or Instagram and tell us where you’d take the Bold New Civic, the bolder the better! Make sure you tag @SharpMotorGroup and use the hastag: #sharphondaweekender in your post and tell your friends to “like” your pic! Prize is use of a Bold New Civic for a weekend and one night’s accommodation for two at QT Gold Coast in an Ocean View King Room. Includes welcome drinks at Stingray, breakfast at Bazaar, and parking for the Civic. Valued at $500. Entries close Thursday 18th August – 12pm. The top 6 entries will be displayed at our launch party and the attendees will determine a winner! Don’t forget, if your pic isn’t public we won’t be able to see it, so check your privacy settings! Winner announced at the launch party – Saturday 20th August, 2016. Register your details at our Bold New Civic launch event and vote for your favourite entry in our photo competition to be entered in the draw. Entries close Saturday 20th August – 1:30pm! Winner announced at the launch party – Saturday 20th August. Click here to read the full terms and conditions of this promotion.